Greatcell Solar Limited (ASX:GSL) (OTCMKTS:DYSOY) provides the Company&apos;s Quarterly Report. 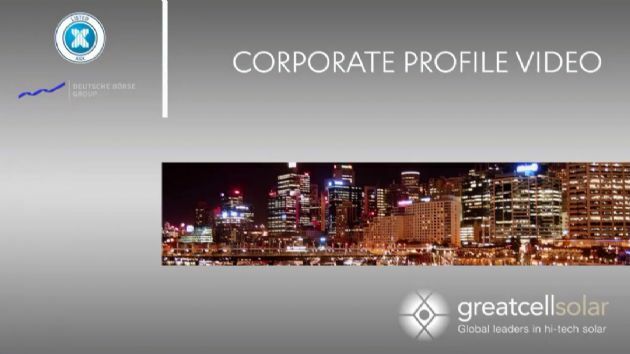 Greatcell Solar Limited (ASX:GSL) (OTCMKTS:DYSOY) provides the Company&apos;s latest Investor Presentation - April 2018. 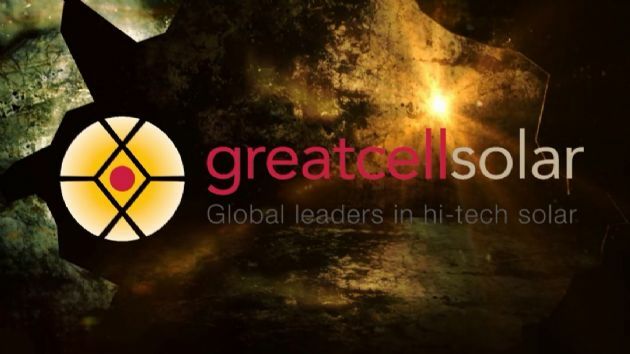 Greatcell Solar Limited (ASX:GSL) (OTCMKTS:DYSOY), global leaders in hi-tech solar, is pleased to advise that it has been awarded EUR500,000 (approximately A$800K) in a European Union Horizon 2020 project known as H2020-SGA-FET-GRAPHENE. The successful grant to Greatcell&apos;s application has occurred through its 100% Italian subsidiary, Greatcell Solar Italy, located in Rome. We refer to our ASX announcement on Thursday, 1st March 2018 where we requested a voluntary suspension of Greatcell Solar Limited&apos;s shares (ASX:GSL) (OTCMKTS:DYSOY). In that announcement we committed to providing a market update on or before 9th March 2018. The directors present their report on the consolidated entity consisting of Greatcell Solar Limited (ASX:GSL) (OTCMKTS:DYSOY) and its controlled entities for the half-year ended 31 December 2017 and the auditor&apos;s review report thereon. Greatcell Solar Limited (ASX:GSL) (OTCMKTS:DYSOY) provides the Company&apos;s Quarterly Report for the period ending 31 December, 2017. Greatcell Solar Limited (ASX:GSL) (OTCMKTS:DYSOY) is very pleased to announce that it has now finalised and signed a Funding Agreement with the Australian Renewable Energy Agency for a $6 million grant under the Advancing Renewables Program. Further to yesterday&apos;s announcement regarding the strategic investment in Greatcell Solar (ASX:GSL) (OTCMKTS:DYSOY) of $4 million at 22 cents per share, the Company is pleased to confirm that the name of the investor is New Moonie Petroleum Pty Limited. Greatcell Solar Limited (GSL) was listed on ASX as Dyesol Limited (DYE) in July 2005 and is headquartered in Queanbeyan, NSW, in Australia. Greatcell Solar Limited (ASX:GSL) (OTCMKTS:DYSOY) provides the Chairman&apos;s Address and MD Presentation at 2017 Annual General Meeting. 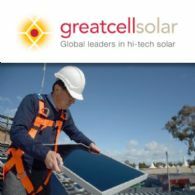 Greatcell Solar (ASX:GSL) (OTCMKTS:DYSOY) is pleased to announce it has executed a subscription agreement for a strategic investment of $4 million at 22 cents per share from an Australian food, water and energy fund. Greatcell Solar (ASX:GSL) (OTCMKTS:DYSOY) is very pleased to announce that Solliance has again achieved a new world record for Perovskite Solar Cell Photovoltaic technology demonstrated on industrially applicable Roll-to-Roll processes of 13.5% conversion efficiency at cell level. 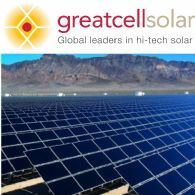 Greatcell Solar Limited (ASX:GSL) (OTCMKTS:DYSOY), global leaders in hi-tech solar, is pleased to advise that it has been awarded EUR700,000 (approximately A$1.1 million) in a European Union Horizon 2020 project known as Apolo. 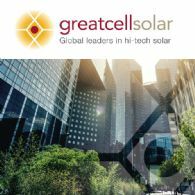 The successful grant to Greatcell&apos;s application has occurred through its 100% Italian subsidiary, Greatcell Solar Italy located in Rome. 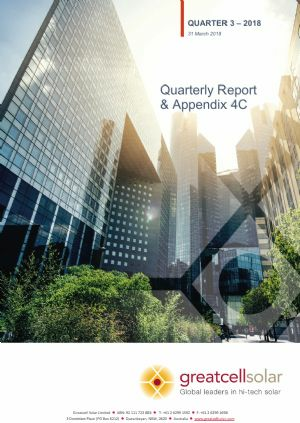 Greatcell Solar Limited (ASX:GSL) (OTCMKTS:DYSOY) provides the Company&apos;s September 2017 Quarterly Report and Appendix 4C. The coming financial year promises to be transformational for Greatcell Solar Ltd (ASX:GSL) (FRA:D5I) (OTCMKTS:DYSOY). The Major Area Demonstration project is relatively capital intensive, however it will significantly de-risk the scaling of the technology as we push inexorably towards mass production. Greatcell Solar Limited (ASX:GSL) (OTCMKTS:DYSOY) provides the Company&apos;s Preliminary Final Report. Greatcell Solar Limited (ASX:GSL) (formerly Dyesol Limited), global leaders in hi-tech solar, is pleased to advise that it has raised $5.3 million from shareholders. Greatcell Solar Ltd (ASX:GSL) (OTCMKTS:DYSOY) MD Richard Caldwell is interviewed by ABN Newswire regarding a number of significant recent developments within the company that form the precursor for the next stage of the company&apos;s growth. Greatcell Solar Limited (ASX:GSL) (OTCMKTS:DYSOY) (formerly Dyesol Limited) wishes to advise that the closing date for its Share Purchase Plan (SPP) has been extended by one week to Friday, 25 August 2017. Greatcell Solar Limited (ASX:GSL) is very pleased to announce that we have received a letter of negotiation (LON) for a $6 million Australian Renewable Energy Agency (ARENA) grant. Greatcell Solar Limited (ASX:GSL) (OTCMKTS:DYSOY) is pleased to present you the opportunity to increase your investment in the Company under the Company&apos;s Share Purchase Plan - with no brokerage or commission costs and at an issue price of AUD 18 cents per share. 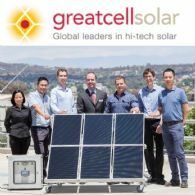 Greatcell Solar Limited (ASX:GSL) (OTCMKTS:DYSOY) is pleased to announce a share purchase plan providing eligible shareholders with an opportunity to increase their shareholding in the Company as it enters an exciting period of scale-up and commercialisation of its revolutionary Perovskite Solar Cell technology. 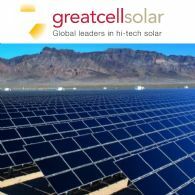 Greatcell Solar Limited (ASX:GSL) (OTCMKTS:DYSOY) provides the Company&apos;s Quarterly Report and Appendix 4C for the period ending 30 June, 2017. Greatcell Solar Limited (ASX:GSL) (OTCMKTS:DYSOY) is pleased to announce that it has signed a non-exclusive Memorandum of Understanding with JinkoSolar (NYSE:JKS), an international Chinese headquartered company and one of the world&apos;s largest photovoltaic solar panel manufacturers. Greatcell Solar Limited (ASX:DYE) (OTCMKTS:DYSOY) is pleased to provide the Company&apos;s latest presentation regarding the rebranding. Dyesol Limited (ASX:DYE) (OTCMKTS:DYSOY) is pleased to advise that, in accordance with the special resolution passed by shareholders at the General Meeting of the Company held on 9 June 2017, the Company&apos;s name has now been changed to Greatcell Solar Limited. Dyesol Limited (ASX:DYE) (OTCMKTS:DYSOY) is pleased to provide the Company&apos;s latest Quarterly Activities Report for the period ending 31 March 2017. Dyesol Ltd (ASX:DYE) (OTCMKTS:DYSOY) is pleased to provide the Company&apos;s latest Presentation to GPVC 2017. Dyesol Ltd (ASX:DYE) (OTCMKTS:DYSOY) is very pleased to announce that Solliance has achieved a world record for perovskite solar cell photovoltaic technology demonstrated on industrially applicable Roll-to-Roll processes of 12.6% conversion efficiency at cell level. The directors present their report on the consolidated entity consisting of Dyesol Limited (ASX:DYE) (OTCMKTS:DYSOY) and its controlled entities for the half-year ended 31 December 2016 and the auditor&apos;s review report. Dyesol Ltd (ASX:DYE) (OTCMKTS:DYSOY) is pleased to advise that it has been awarded a $2.5 million grant under the Cooperative Research Centre Projects programme. 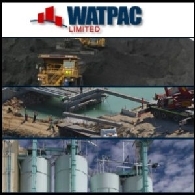 The grant is administered by the Australian Department of Industry. Dyesol Ltd (ASX:DYE) (OTCMKTS:DYSOY) is pleased to provide the Company&apos;s Quarterly Report for the period ended 31 December, 2016. Dyesol Ltd (ASX:DYE) (OTCMKTS:DYSOY) is pleased to provide the company&apos;s Chairman&apos;s Address and MD Presentation at 2016 AGM. Dyesol Ltd (ASX:DYE) (OTCMKTS:DYSOY) is pleased to provide the company&apos;s Quarterly Report and Appendix 4C for the period ended 30th September 2016. 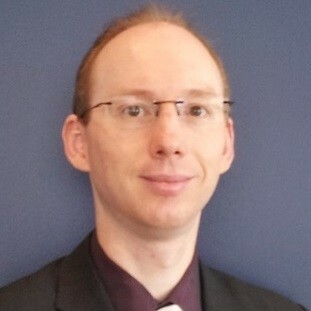 AUDIO: Dyesol Ltd (ASX:DYE) (FRA:D5I) (OTCMKTS:DYSOY) Interview with Richard Caldwell on the Letter of Intent that it has signed with the Commonwealth Scientific and Industrial Research Organisation (CSIRO) to collaborate in the field of Perovskite Solar Cells (PSC). Dyesol Ltd (ASX:DYE) (OTCMKTS:DYSOY) is pleased to announce that it has signed a Letter of Intent with the Commonwealth Scientific and Industrial Research Organisation to collaborate in the field of Perovskite Solar Cells. 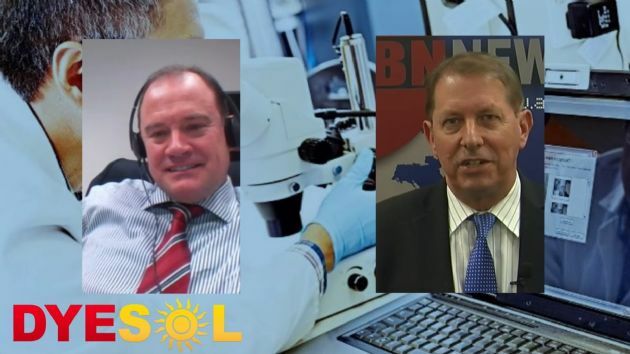 Dyesol Ltd (ASX:DYE) (OTCMKTS:DYSOY) Managing Director Richard Caldwell speaks with ABN Newswire about the recent patent application for improving the efficiency of the perovskite solar cell, and the UK funding body approving a grant of GBP800,000 for research and development. Dyesol Ltd (ASX:DYE) (OTCMKTS:DYSOY) are pleased to provide the Company&apos;s Annual Report 2016 to shareholders. Dyesol Limited (ASX:DYE) (OTCMKTS:DYSOY) and its collaboration partners have been awarded an approximate GBP800,000 grant from the Engineering and Physical Sciences Research Council (EPSRC). The EPSRC is the UK&apos;s main agency for funding research in engineering and the physical sciences. The principal grant applicants are Dyesol (UK), Cristal and The University of York. Dyesol Limited (ASX:DYE) are pleased to provide the Company&apos;s Quarterly Report and Appendix 4C for the period ending 30 June 2016. Dyesol Ltd (ASX:DYE) are pleased to provide the Company&apos;s March 2016 Quarterly Report. Dyesol Ltd (ASX:DYE) leads with technology and justly considers itself breaking new ground in the rapid scale-up of Perovskite Solar Cell (PSC) technology. During the half we successfully tackled both light soaking and thermal degradation tests for high efficiency strip cells. These are the challenges behind ultimately meeting the accreditation standard IEC 61646. Speaking firstly about the significant achievements for 2015, Dyesol Ltd (ASX:DYE) (OTCMKTS:DYSOY) Managing Director Richard Caldwell expands on the major area demonstration partnership with VTD EGL engineering firm. Dyesol Ltd (ASX:DYE) (OTCMKTS:DYSOY), global leader in the development and commercialisation of Perovskite Solar Cells (PSC), is delighted to announce that it has appointed VDL Enabling Technologies Group (VDL ETG) to assist in the development of a Major Area Demonstration Prototype. Dyesol Limited (ASX:DYE), global leader in the development and commercialisation of Perovskite Solar Cells (PSC), is delighted to announce that it has successfully completed a capital raising of $8.1 million. Dyesol Limited (ASX:DYE) is very pleased to announce that a research team headed by Professors Michael Grätzel and Anders Hagfeldt at the Ecole Polytechnique Fédérale de Lausanne (EPFL) has established a new world record efficiency for its Perovskite Solar Cells (PSC), with a certified conversion efficiency of 21.02%. 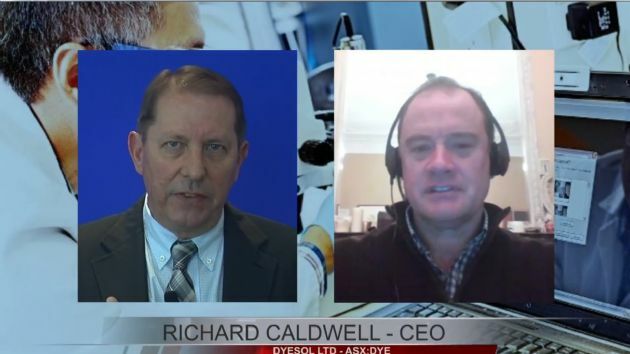 Dyesol Ltd (ASX:DYE) CEO Richard Caldwell is interviewed by ABN Newswire regarding the Perovskite Solar Cell (PSC) technology and the company&apos;s progress. Dyesol Limited (ASX:DYE) (OTCMKTS:DYSOY) Annual General Meeting 26th November 2015 and Presentation. Dyesol Limited (ASX:DYE) (OTCMKTS:DYSOY) is pleased to announce a share purchase plan (SPP) providing shareholders with an opportunity to increase their shareholding in the Company as it continues to pursue its goal of scale-up and commercialisation of its revolutionary Perovskite Solar Cell (PSC) technology. Dyesol Ltd (ASX:DYE) recently announced it had reached an agreement with ARENA to receive $450,000 funding support to progress its Perovskite Solar Cell (PSC) technology towards scalable manufacture and mass commercialisation. While the critical key performance targets relate to achieving targets of efficiency and durability for our PSC technology, the program also involves a number of other important deliverables. Dyesol Ltd (ASX:DYE) announce the September 2015 Quarterly Report with significant highlights. Dyesol Ltd (ASX:DYE) MD Richard Caldwell Speaks with ABN Newswire on the ARENA Agreement as well as the planned prototype production slated for 2016. 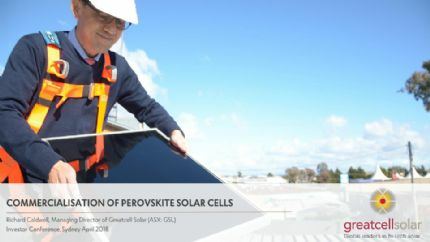 Leading Australian solar innovation company Dyesol Ltd (ASX:DYE) has reached agreement with the Australian Renewable Energy Agency (ARENA) for funding support of $449,000 to progress its Perovskite Solar Cell (PSC) technology towards scalable manufacture and commercialisation. Dr Damion Milliken talks about the Perovskite Solar Cell Technology (PSC) which is a new crystal based technology that is on the verge of commercialization. The company is focused on delivering a thoroughly tested new generation solar cell that has a wide range of applications in low light conditions as well as building integrated uses. Dyesol Limited (ASX:DYE) (OTCMKTS:DYSOY), the world leader in the industrialisation of perovskite solar cell (PSC) technology, has recently passed an important Technology Advisory Board milestone in taking the technology from "lab-to-fab". FY2015 was a very positive year for Dyesol Ltd (ASX:DYE) with significant progress on the achievement of all formal technical milestones as the Company implements plans for scale-up and commercialisation. Dyesol UK Limited, a 100% subsidiary of Dyesol Limited (ASX:DYE) (OTCMKTS:DYSOY), is delighted to announce that it is a key member of a European consortium that has secured a substantial Horizon 2020 grant of approximately EUR3 million from the European Commission. Dyesol&apos;s share of the grant is EUR650,000 or approximately A$1 million. Dyesol Ltd (ASX:DYE) (OTCMKTS:DYSOY) announce the June 2015 Quarterly Report with significant highlights. Dyesol Limited (ASX:DYE) (OTCMKTS:DYSOY), world leader in the industrialisation of Perovskite Solar Cell (PSC) technology, and Solliance are pleased to announce they have signed an agreement formalising Dyesol&apos;s entry as an Industrial Partner to Solliance, a world-class solar energy consortium situated in Eindhoven, The Netherlands. Asian Activities Report for August 15, 2011 includes: Dyesol Limited (ASX:DYE) achieved final milestones at the dye solar cells on steel project; U3O8 Limited (ASX:UTO) today announced further sampling results from the Saltwater Pool joint venture project in Western Australia; Legacy Iron Ore Limited (ASX:LCY) will commence a second phase of 6,000m RC drilling next week at the Mt Bevan Iron Ore project in Western Australia; Alkane Resources Limited (ASX:ALK) has signed a Memorandum of Understanding ("MOU") to form a joint venture to market zirconium products. The Australian share market lost much of its early gains after NAB&apos;s surprise bid for the local and New Zealand assets of AXA Asia Pacific Holdings. Woodside&apos;s capital raising also gave the market a pullback. At the close, the local market was slightly higher. The benchmark S&P/ASX200 index closed up 8.4 points, or 0.18 per cent, at 4670.3 points, while the broader All Ordinaries index gained 13.5 points, or 0.29 per cent, to 4689.6 points. The world leader commercialising DSC (dye solar cell) technology and products, Queanbeyan headquartered Dyesol Limited (ASX:DYE)(PINK:DYSOF) has won the ACT Chief Minister&apos;s 2009 Export Award for the Small to Medium Manufacturer&apos;s Category. Winners of the State and Territory Export Awards are automatically entered into the Australian National Export Awards. 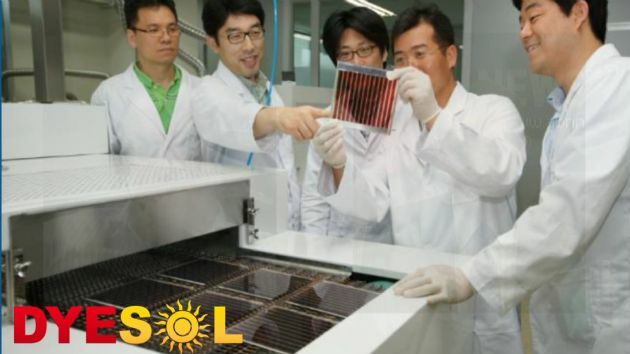 Dyesol Ltd. (ASX:DYE) has entered into a EURO 600,000 (approximately AUD$1M) contract with Korean company Acrosol to supply a turnkey R&D laboratory and provide comprehensive training in Dye Solar Cell (DSC) development. Dyesol Limited (ASX: DYE) - (ASX: DYE) and Corus Commence Next Phase of DSC on Steel Project - Dr Gavin Tulloch, President (ASX: DYE) International; Dyesol Limited (ASX: DYE) present the following audio webcast regarding "DYE - DYE and Corus Commence Next Phase of DSC on Steel Project - Dr Gavin Tulloch, President DYE International". You may also download this audio webcast to your computer or portable audio player. Dyesol Limited (ASX: DYE) - 2007 Annual General Meeting - Mrs Sylvia Tulloch, MD; Dyesol Limited (ASX: DYE) present the following audio webcast regarding "2007 Annual General Meeting". You may also download this audio webcast to your computer or portable audio player. Dyesol Limited (ASX: DYE) - Expansion Strategy - Dr Gavin Tulloch, President (ASX: DYE) International; Dyesol Limited (ASX: DYE) present the following audio webcast regarding "Expansion Strategy". You may also download this audio webcast to your computer or portable audio player. Dyesol Limited (ASX: DYE) - 2007 Full Year Results - Mrs Sylvia Tulloch, MD; Dyesol Limited (ASX: DYE) present the following audio webcast regarding "2007 Full Year Results - Mrs Sylvia Tulloch, MD". You may also download this audio webcast to your computer or portable audio player. Dyesol Limited (ASX: DYE) - MOU in Thailand Strengthens Dyesol Asian Operations - Mr Gordon Thompson, Director; Dyesol Limited (ASX: DYE) present the following audio webcast regarding "MOU in Thailand Strengthens Dyesol Asian Operations - Mr Gordon Thompson, Director". You may also download this audio webcast to your computer or portable audio player. Dyesol Limited (ASX: DYE) - International Expansion Strategy - Mrs Sylvia Tulloch, MD; Dyesol Limited (ASX: DYE) present the following audio webcast regarding "International Expansion Strategy". Dyesol Limited (ASX: DYE) - Completion of Placement and Introduction of Share Purchase Plan - Mrs Sylvia Tulloch, MD; Boardroomradio is pleased to announce that Dyesol Limited (ASX: DYE) has published an audio file. Dyesol Limited (ASX: DYE) - Achieves Next Partnership Goal - Mrs Sylvia Tulloch, MD; Boardroomradio is pleased to announce that Dyesol Limited (ASX: DYE) has published an audio file. Dyesol Limited (ASX: DYE) - $360,000 Grant for Dyesol QUT Project - Mrs Sylvia Tulloch, MD; Boardroomradio is pleased to announce that Dyesol Limited (ASX: DYE) has published an audio file. Dyesol Limited [B@1f34a65; Boardroomradio is pleased to announce that Dyesol Limited (ASX: DYE) has published an audio file. Dyesol Limited (ASX: DYE) - Strong Order Book and Prospects - Mr Richard Caldwell, Non. Dyesol Limited (ASX: DYE) - Year in Review and Activities Update - Mrs Sylvia Tulloch, MD; Boardroomradio is pleased to announce that Dyesol Limited (ASX: DYE) has published an audio file.